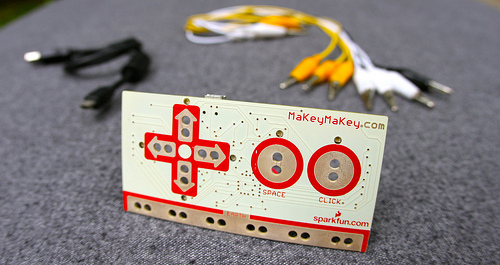 Makey Makey is ‘an invention kit for everyone’ and really is wonderful in its simplicity. So you can turn almost anything into a controller for a computer. There are videos of people playing music on bananas, controlling games with modelling clay and so on. For kids wanting to make something in the real world that will interact with a computer it doesn’t come better than this. There are some limitations – it’s only analogue input, so you know if a nominated key has been pressed, that’s it. We also found the system to be occasionally flakey with keypresses being registered via a single wire rather than when the whole circuit was closed: Just fiddling with the connections seemed to fix that. Overall the Makey Makey is about as simple a way as can be imagined of getting your computer connected to the real world. My test pilot was, in minutes, writing Scratch programs that reacted to various things being touched. The kit costs around $60. You can buy it locally online; we got ours the old-fashioned way by walking into Professor Plum’s.